"Free safety Ryan Clark #25 of the Washington Redskins sits on the sideline in the second quarter against the Seattle Seahawks at FedExField on October 6, 2014 in Landover, Maryland." Any competitor will tell you they hate losing - whether it's by one or one hundred. Being an athlete myself, I have certainly been in the games where it gets away and it's evident there is no coming back for the victory. That doesn't stop oneself from pushing to do something great and possibly cutting the massive lead in half. There is no quit. But there is struggle without a doubt. With a quick touchdown by the New York Giants against the Washington Redskins in the first quarter, and them marching down the field again, it was looking like a blowout shaping up. Eventually down by 17 points at the half, I was continually looking for an image that helped tell that story of defeat. 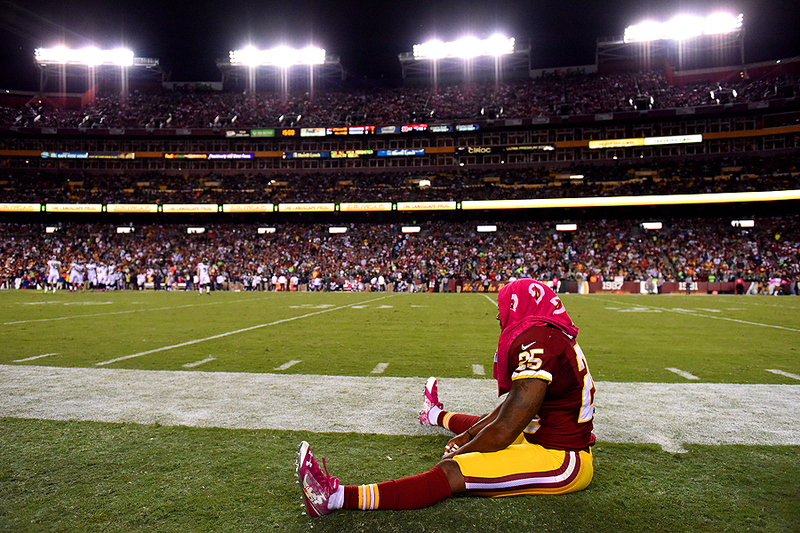 As I made my way down the sideline, I stopped as I saw Ryan Clark of the Redskins sitting there. One could only imagine what was going through his mind, but I was drawn in by the repetitious background, his body language and solidarity that isn't often seen on a crowded football sideline.